I always appreciate Roberta’s take on things, even though I think that she (and The Lens) sometimes rely on a narrative that is preservation precious, meaning it focuses on historic corridors and “worthy” buildings over a real housing criticism. Her exultation over the neighborhood corridor boom is a bit odd when in New Orleans, neighborhood mom and pops simply never went away but instead brought back after the levee breaks whiter and trendier than before. Maybe the real issue is the feeling I often have that too many people still have a vision in their head of a return to the halcyon days of Main Street America, circa 1950, and expect city hall to deliver us a version of that, even though our lives and shopping have changed completely. That thinking limits the potential of old corridors and gives tacit approval to keep them empty until someone can redevelop them as before rather than re-imagining storefronts as low-income rental units or as rooms for unhoused population or shared workspaces or (gasp) even green space where buildings were before. However, Roberta was spot on in her early assessment of the new hospital zone – about it being a developers boondoggle and about offering those jokers retail leases at ground floor and not about a better hospital than Charity. That one of its aims wasto kill the street retail of Canal Street of one type by moving it to Tulane and likely make the old street filled with very exclusive shops and hotels- that is already coming to pass. She is right about the code busting happening at City Hall: the new CZO is a joke. A form-based approach to zoning would be much more appropriate to our city than what we got. The argument about streetcars is sort of lame, as the Rampart line going to Poland was stymied by the railroad and not by local policy or willingness, and the lack of public transportation is a deep and long problem that is not changed by that type of investment that involves streetcars which are clearly for the visitor. Of course I am annoyed by her ignoring the French Quarter, my neighborhood, which is still a neighborhood and pound for pound the most active, diverse and mixed use area in the city in any 24-hour period; yes we have millions of visitors in our midst, but also have a somewhat steady population since K (and the changes correlate to the Orleans Parish census), more residents than the Marigny, or Bayou St. John or some other areas. We got our problems and some of them like development (or an overemphasis on festival culture!) are getting worse like every other area, but don’t dismiss us just ‘cuz that is the “supernative” thing to do when talking about New Orleans! Since she was a many-times return visitor who then bought a home (although I think she may have since sold it) I am surprised at her toss off of the short-term rental issue. It seems to me it requires a thoughtful approach by thinkers like her, as she must know that it has allowed many homeowners to keep their house here and to do repairs and new residents to decide where to buy, and so when used well by principal homeowners, this system can be a boon. But let’s give her writing the credit it is due: “Jacobs did not try to dictate how things ought to be; she wasn’t prescriptive..Local wisdom, she found, is where the best ideas for change take root. They don’t come from political leaders, planning professionals, developers or credentialed experts.” This is so right and because it is what I try to do in my work, I am glad to see it written so beautifully and simply. First, according to the Data Center, the numerical changes in our FQ neighborhood correlate to the dip in the entire parish. Second, those changes have a lot to do with the love affair planners and neighborhood associations have with encouraging massive single home renovations over incentivizing real mixed use. And the resident and business associations allowing heavy trucks in by just paying a small fee, actively discouraging bike or scooter parking, allowing film and festival culture to take over our area constantly are part of the problem residents have to overcome. Here are some things associations can do right now to swing the pendulum the other way: work to incentivize rent controlled apartments by offering tax breaks to those homeowners who have little used property (including upper floors of commercial buildings, especially on Chartres, Decatur and Canal), walk to find and fine those who hang key boxes on their gate that indicate illegal STR units, create a citizen reporting app to allow FT residents to file complaints immediately and directly about code violations and stop focusing on tshirt shop raids and instead focus on adding amenities that residents care about. 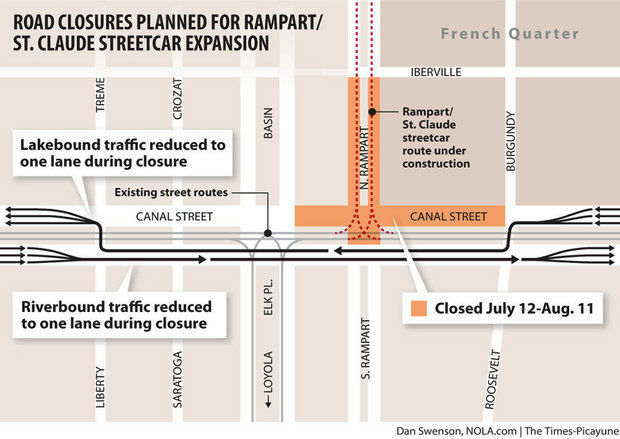 The looming logjam is necessary to allow Archer to install a so-called “half grand union,” an elaborate forking of track that eventually will let Rampart streetcarstravel toward the foot of Canal Street or jag to the right and continue along Loyola Avenue to the Union Passenger Terminal. When a similar installation took place on the Loyola Avenue line, it took four months to finish. WPA removing car tracks on Burgundy Street near Dumaine Street, 1937. 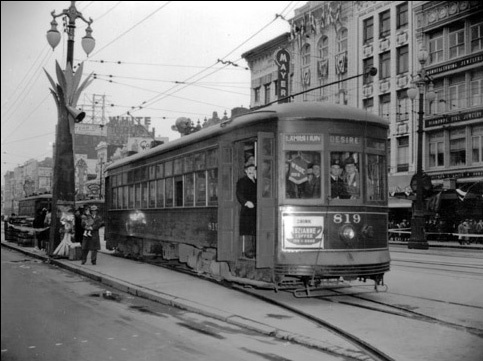 Desire streetcar ran down Decatur through the French Market, over to Royal and down to Canal, then back down Bourbon.